Download a free version and create your SWF slide show now! 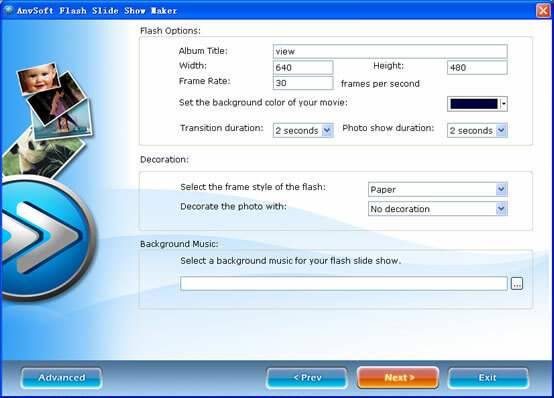 ANVSOFT Flash Slide Show Maker is a Flash album creator to make animated photo slide shows with SWF file as the output format. It transforms your digital photo collection to Macromedia Flash file format ( SWF ) which you can share your memorial moments with your family or friends on your own homepage or website. 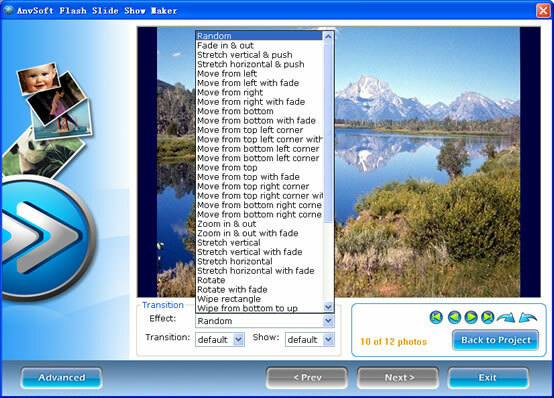 With ANVSOFT Flash Slide Show Maker, you can easily turn a folder full of still images into a stunning Flash slide show with background music and special transition effects . 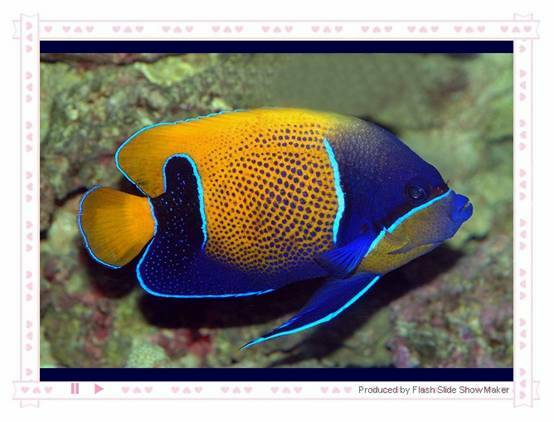 This Flash slide show software allows you to add nice looking animated slide shows to your website in no time! Click here to download Flash Slideshow Maker Now! The following document provides you a brief introduction to the software and how to create a SWF slideshow from your photo collection. 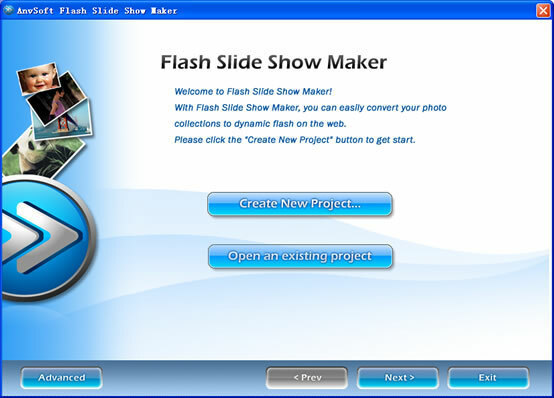 Creating projects in Flash Slideshow maker involves a three step workflow where you can organize and make your photo slideshow, set flash options and publish the flash slideshow. You can select photos from these folders. If you want to select only one photo in a folder, please click the thumbnail of the picture, after it selected, click “open”, and then it will appear in the slide panel. If you want to select several pictures at the same time, please press “Shift” or “Ctrl” while clicking the pictures. Select the photo you want to delete, and click the “delete”, and then the selected photo will be removed from your slideshow. Actually, the photo is just removed from the slideshow and the original image file is not removed. If you want to remove several photos at the same time, please press “Shift” or “Ctrl” while selecting the photos. and : to rotate the selected slide 90°counterclockwise or 90°clockwise. Select a slide, and then click the “View Photo” button, you can view the slide in large size. You can also see the large size of the slide by double-clicking the slide. Double click the thumbnail of the slide or click the “View Photo” button, and then you can view the slide in large size. Then at the bottom of the slide, you can customize the transition effect of the individual slide by selecting a type of effect provided by the software. More than 40 transition effects are available now. Notes: You can select photos from your file folder in your computer. 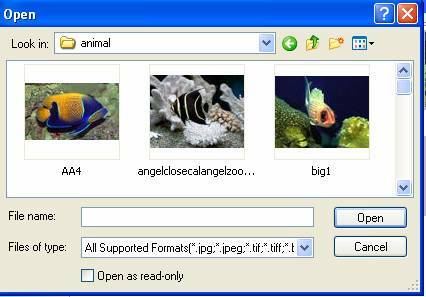 These formats, including JPEG, TIFF, Bitmap and PNG, are supported by the software. Flash Options: to set the relating parameters of the flash, including Album Title, Width, Height, Frame Rate, background color of the flash and the transition duration. Player Theme: to select a theme for your flash player. The theme will decide the appearance of your flash player when you play your SWF file. Several options are provided for your selection, such as paper, heart and cool, etc. Background Music: to add background music from your file folders to your flash slideshow. 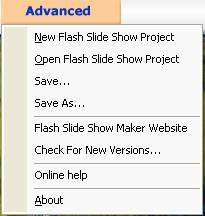 You can select your favorite music and then click “open” button, and it will be added to your flash slideshow and the file path will be displayed in the blank. 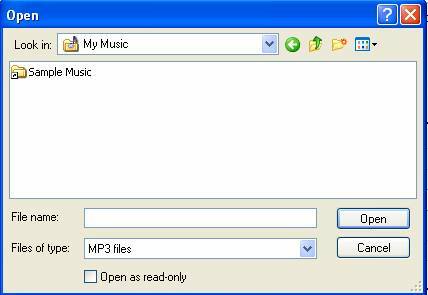 By now, the file formats such as MP3, WMA and WAV are supported by the software. In this window, you can select the path to save the files, including flash file and html file, and enter the file names. After you finishing the setting, please click the “Publish Now” button and your slideshow will be published to and saved in the appointed address. Notes: During these three steps, you can go back to the previous step by clicking the button and make any changes as you like. Copyright © 2006 - 2008 FLASH-SLIDESHOW-MAKER.COM All rights reserved.